In the Information Age, information is an asset to be protected and policymakers need to know what information security is and how to take action against information leakage and infringement. 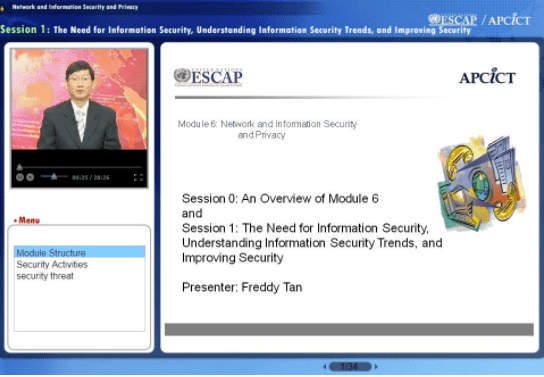 This module provides an overview of the need for information security, information security issues and trends, and the process of formulating an information security strategy. Provide an overview of standards of information security and privacy protection that are used by some countries and international information security organizations. Formulate or make recommendations regarding information security policy that would be appropriate to their own context. The Korea Information Security Agency (KISA) was established in 1996 by the government as a centre of excellence responsible for nationwide promotion of efficient policymaking for the enhancement of information security. Its functions include prevention of and response to Internet infringements, spam response, privacy protection, electronic signature, critical infrastructure protection, security evaluation for information security products and industrial support, in-depth policy and technology development, and awareness-raising towards the establishment of a safe and reliable information society.